How much energy, effort and money has your workplace wasted on hiring the wrong people? Studies estimate that a bad hire costs most organizations up to 30% of that person’s first year salary, but that doesn’t include the cultural costs a team suffers when the wrong person winds up in a job. And while organizations like Zappos.com now offer new recruits $5,000 to quit during induction, taking a strengths-focused approach to recruitment offers a simpler and more affordable way to improve the effectiveness of your recruitment efforts. Find candidates who will thrive in your roles by learning to write strengths-focused position descriptions that align people’s talents and values with their responsibilities. Attract the best and brightest people to your roles by using our done-for-you templates to create strengths-led recruitment advertisements that call out to your dream candidates. Take the guesswork out of finding what truly motivates people, their commitment to developing their strengths and their suitability for a job by conducting strengths-based recruitment interviews that make it easier to identify the strongest candidates for your roles. A short training video detailing how leaders can recruit people using a strengths-focused approach. 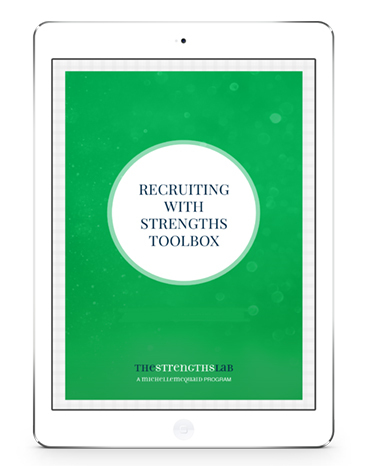 An introduction guide with the business case for strengths recruitment and a step-by-step instruction guide to help you build strengths-based recruitment practices in your workplace. Done-for-you templates and playsheets you can download, print, and steal with pride to help you craft strengths-focused job descriptions, write strengths-led recruitment ads, and conduct strengths-based recruitment interviews. *This is a digital product. When you purchase this product, you will receive an email that gives you access to all the materials in the membership area. Looking for The Complete Strengths Leader’s Toolbox?